Intrigue Dance and Performing Arts Center is dedicated to teaching, sharing, and encouraging a passion for the art of dance and performance. Our highly skilled teachers are committed to creating a fun and safe learning environment for adults and children alike. 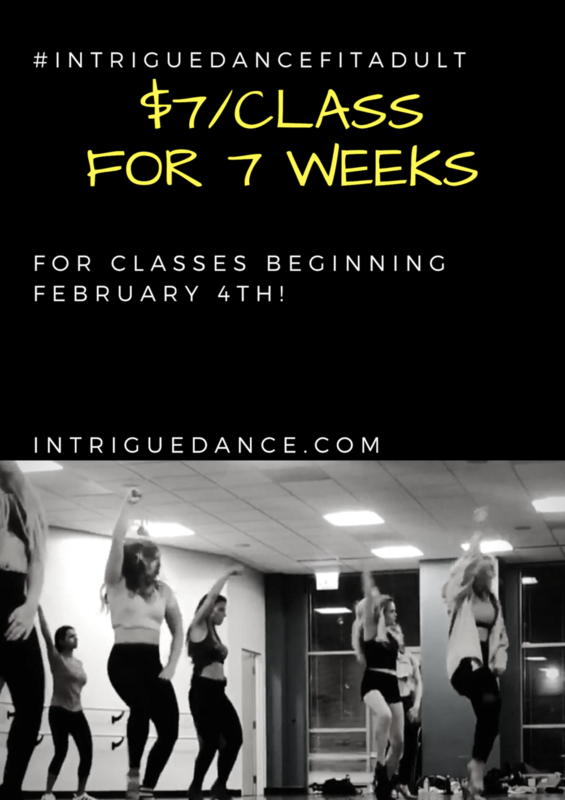 By inspiration, determination, and discipline, Intrigue Dance aspires to "intrigue" people of all levels and backgrounds to follow their love for dance. Come after brunch or before a night on the town. Hip Hop, one of our most popular formats, will focus on a hip-hop warm-up and workout. The remaining 30 minutes focus on learning fun choreography through a dance combination made to get you moving, looking good, and feeling your best! For a further description of Hip-Hop, see the descriptions below. **Memberships are automatically renewed each month until cancelled. Cancellation requests must be made in writing (or by email to management@intriguedance.com) at least 2 weeks prior to membership renewal date. Please note that when paying by credit/debit card, a $1.00 surcharge will be added on payments under $50.00 and a $2.00 surcharge will be added for payments over $50.00. This surcharge does not apply to payments made through a payment plan. Ballet is the basis of all forms of dance. Ballet gives the dancer the ability to create a strong foundation for any dance style, and teaches proper control, technique, strength, and flexibility. Jazz encompasses many different styles of music, movement, and creativity. It teaches strength, flexibility, agility, emotion, grace, and perseverance. From contemporary jazz to classical jazz, this form of dance is important in creating a well-rounded dancer. This class, for both dancers and non-dancers, is filled with exercises that allow students to explore different kinds of movement. We will interpret what we hear in both music and silence, and portray that emotion through confident, expressive dance moves. This is a great class for students to be creative and expand their range of movement, as well as work on listening and communicating with their body. Dance with your fullest potential! Choreography is taught in an add-on format with an emphasis on timing, musicality, and personal style. Perform with confidence in any venue be it the wedding floor, house party or the club scene. Using a layered gradual pace of teaching keeps the class in constant motion, therefore delivering a great cardio challenge. Student will notice better coordination, reflexes, and stronger stamina. Stretch and strength - Focused on using body weight to do a variety of exercises that strengthen and extend range of motion. Students looking to support posture and movement while decreasing back pain and stiffness will appreciate the added attention to developing core muscles and the posterior chain. This is a total body workout that has many modifications to accommodate all fitness levels, needs, and body types. Benefits include increased abdominal strength, stronger physical endurance, enhanced body awareness, and increased flexibility. Intrigue’s modern class usually focuses on the Horton technique, which incorporates many elements, including Native American and Jazz dance. Horton technique incorporates a whole body approach including flexibility, strength, coordination, and freedom of expression. Focused on using body weight to do a variety of exercises that strengthen and extend range of motion. Students looking to support posture and movement while decreasing back pain and stiffness will appreciate the added attention to developing core muscles and the posterior chain. This is a total body workout that has many modifications to accommodate all fitness levels, needs, and body types. Benefits include increased abdominal strength, stronger physical endurance, enhanced body awareness, and increased flexibility.